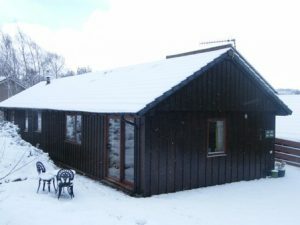 The Old Log Shed is situated in the Spey Valley in the heart of the Cairngorms National Park, in the Scottish Highlands and only a short distance from Kingussie and Aviemore. The well appointed timber chalet, which adjoins our family home, has patio doors from the main room on to an outdoor living area with a backdrop of natural forest stretching into Glenfeshie and the Cairngorms mountains. The Insh Marshes, a popular spot for birdwatching, is accessible from Insh village. 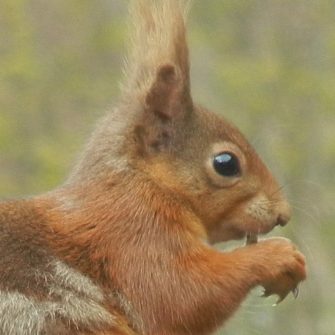 Squirrels, badgers, deer and pinemarten make regular visits to the garden and can be watched from the comfort of the patio window! The Old Log Shed is an ideal centre for daily excursions in the Highlands and a list of suggested walks and car trips is provided. a light and airy living/kitchen/dining area with patio windows looking on to a sunny garden. the bedroom has either a king size bed or twin beds with ensuite bathroom. Please state which you would prefer. the built-in shower is spacious with electric shower unit. kitchen is supplied with an integral electric cooker, microwave and fridge. watch the wild life pass while enjoying the comfort of your own home! There are excellent links by train (from Kingussie) and air (from Inverness) to the south. (The overnight sleeper also stops here). 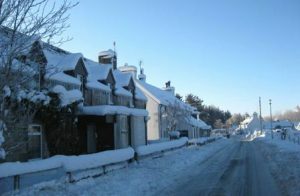 We are only 2.5 hrs drive from Edinburgh and Glasgow and 10 miles from Aviemore where there is access to the Cairngorm mountains and Loch Morlich. 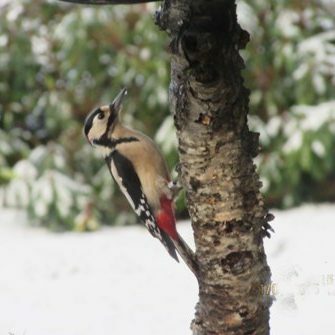 Walking, ski-ing, orienteering, climbing, fishing, bird watching and golf can all be enjoyed within a 20 mile distance of Insh. Please look at the Out and About page for further details. Watch deer, pheasants and other wildlife pass by the window in the comfort of your own home!